UPDATE 1/16/11: Physamajig has been selected as a finalist in the Windows 8 First Apps Contest! 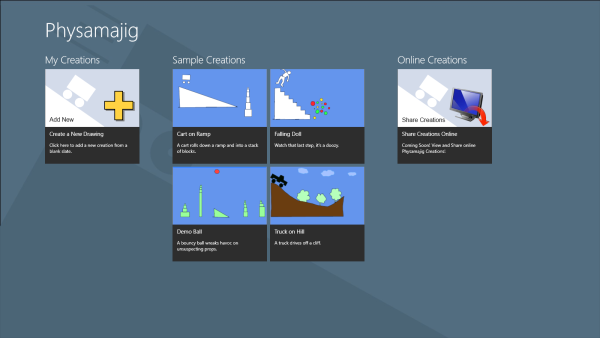 What I came up with is "Physamajig" - a Metro style app that allows you to interactively create physics simulations in Windows 8! Physamajig is similar to a WP7 app I created called "Paint to Life" - but it takes things much further by including many new tools, joints, physics properties, file options, and more! And I have to say that the Windows 8 Metro version of this app looks much more slick than the WP7 version. The app comes with several sample creations pre-installed, and one of the next features I am working on is a web service so that users can share their creations online. If you're building any apps for the Windows 8 Contest, I'd be happy to know more about them - please share!